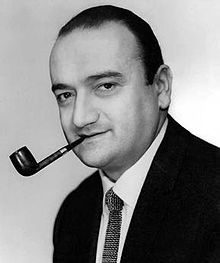 Prolific filmmaker Henri Verneuil was one of the well-known names in French cinema for forty years, and closed his cinematographic career with two autobiographic films that narrated the Armenian experience. He was born Ashod Malakian on October 15, 1920, in Rodosto, Turkey. The Malakians emigrated from their hometown in 1924 as a result of Turkish anti-Armenian persecution in the years after the genocide and settled in Marseilles (France). Young Ashod graduated from the French lyceum in Aix-en-Haute and entered the École Nationale d’Arts et Metiers in Aix-en-Provence (1942). Upon graduation in 1944, he put aside his technical diploma and started working as a journalist. In 1945 he wrote an article about the Armenian genocide and the editor suggested he adopt a French name to make it look more objective. Thus, Henri Verneuil was born. In the postwar, Verneuil entered the world of cinema. He directed his first short film in 1946 and moved to Paris in 1949, where he became an assistant director. In 1951 he directed his first feature, the black comedy The Hunting Ground. His second film, the drama Forbidden Fruit (1952), won him international acclaim. Both films featured the great French comic actor Fernandel in the main role. The same actor played the six main roles (a father and his five sons) in The Sheep Has Five Legs (1954), which earned the first prize at the Locarno International Film Festival and an Oscar nomination for best script to Verneuil in 1955. Verneuil’s biggest hit, before the New Wave of the 1960s, was The Cow and I (1959), once again with Fernandel. Later he also directed other movie stars including Jean Gabin, Alain Delon, Lino Ventura, Jean Paul Belmondo, Yves Montand, and Michele Morgan. In the 1970s he directed a few films in English with Anthony Quinn, Yul Brynner, and Henry Fonda. His last commercial film was in 1984. Afterwards, the veteran filmmaker would focus on his Armenian heritage. In 1985 he published an autobiographical work, Mayrig, which recounted his childhood and the Armenian experience in Marseilles. It would become the basis for his two last films, Mayrig (1991) and 588, rue Paradis (1992), featuring Omar Sharif and Claudia Cardinale. In 1988 he had directed the video clip of “Pour toi, Arménie” (For You, Armenia), the song composed by Charles Aznavour to the benefit of the victims of the 1988 earthquake in Armenia. In 1996 Verneuil, who had earned the French Legion of Honor in 1955, was awarded an honorary César, France’s equivalent of the Oscar, for lifetime achievement in film. He was elected a member of the Academy of Fine Arts in 2000. He died in Bagnolet, a suburb of Paris, on January 11, 2002. Two of his children, Patrick Malakian (a TV director) and Gaya Verneuil (an actress), followed in his steps. Several streets and squares in France and Armenia bear his name.